12 High quality HB No. 2 Lead, Assorted colors (You may not get all colors shown on the picture, It'll depend on availability, if you want to add or subtract to a color, please let us know by email), Hexagon graphite pencils, Non smear eraser. **PERSONALIZATION: Personalized and custom imprinted. You can have up to 32 characters (including spaces) one line (available special characters: $ # - _ @ ? / & () .period ,comma ' " : ; **DO NOT USE ! EXCLAMATION MARK**). Final product will show all letters on upper case. Same text and text color for each 12 pencils. 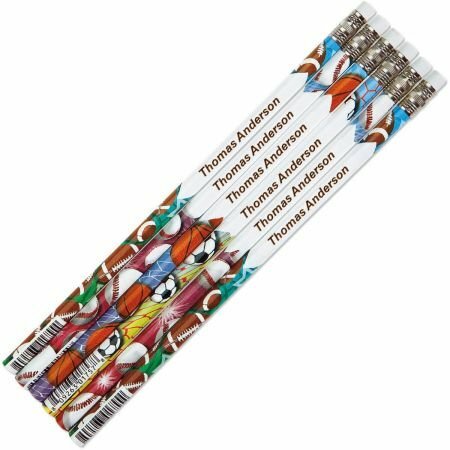 **SHIPPING: Pencils orders are normally shipped by "USPS" United State Postal Services; please make sure your address is a valid USPS deliverable address. 12 High quality HB No. 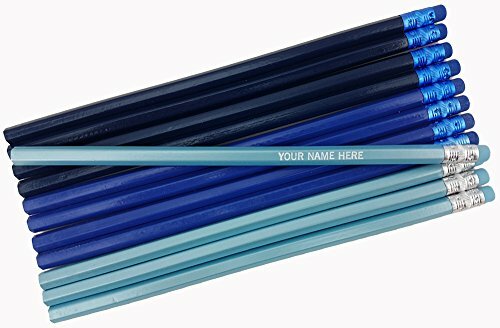 2 Lead, You'll get 4 of each: Dark Blue, Sea Blue & Pearl Blue barrel, Hexagon graphite pencils, Non smear eraser. **PERSONALIZATION: Personalized and custom imprinted. You can have up to 32 characters (including spaces) one line (available special characters: #, @, ?, /, &, (, ), .period, ,comma, ', ", :, **DO NOT USE ! EXCLAMATION MARK**). Final product will show all letters on upper case. Same text and text color for each 12 pencils. **SHIPPING: Pencils orders are normally shipped by "USPS" United State Postal Services; please make sure your address is a valid USPS deliverable address. 12 High quality HB No. 2 Lead, Round graphite pencils, Non smear eraser. **PERSONALIZATION: Personalized and custom imprinted. You can have up to 20 characters (including spaces) in one line. Same text and text color for each 12 pencils. **SHIPPING: Pencils orders are normally shipped by "USPS" United State Postal Services; please make sure your address is a valid USPS deliverable address. 12 High quality HB No. 2 Lead, Dark Blue barrel, Hexagon graphite pencils, Non smear eraser. **PERSONALIZATION: Personalized and custom imprinted. You can have up to 32 characters (including spaces) one line (available special characters: $ # - _ @ ? / & ( ) .period ,comma ' " : ; **DO NOT USE ! EXCLAMATION MARK**). Final product will show all letters on upper case. Same text and text color for each 12 pencils. **SHIPPING: Pencils orders are normally shipped by "USPS" United State Postal Services; please make sure your address is a valid USPS deliverable address. 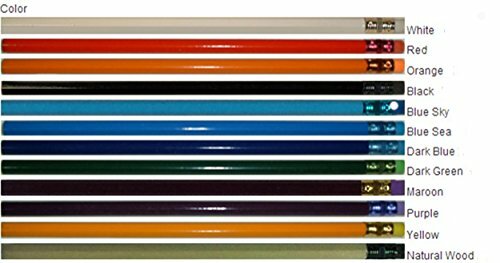 The best for most purposes, our colorful #2 hardwood pencils are great for school, perfect for home or office, too. Set of 12. Specify name or message up to 30 characters. 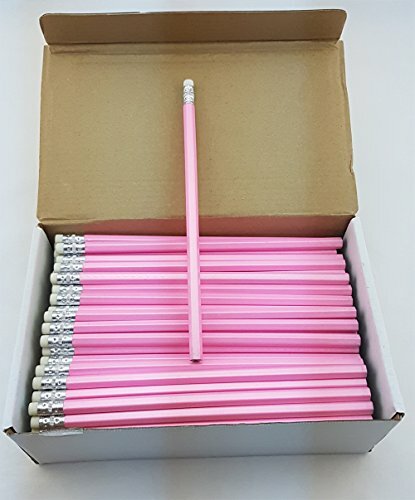 144 pencils (1 gross) Box - High quality HB No. 2 Lead, Nice Colors, School pencils with eraser. Unharpened - School Supply, Office Supply, Party Favor, Family Party, Game Room **SHIPPING: Pencils orders are normally shipped by "USPS" United State Postal Services; please make sure your addss is a valid ddress. rable address. 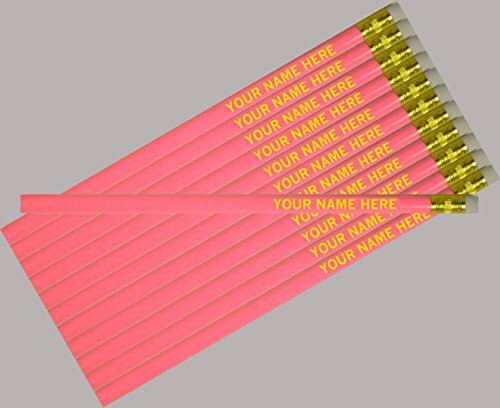 Choose any name or message, and we'll print it on these quality personalized hexagon bright pencils for FREE. Be conservative (John Doe), romantic (I Love John), businesslike (John's Plumbing), even bold (Call Me John). 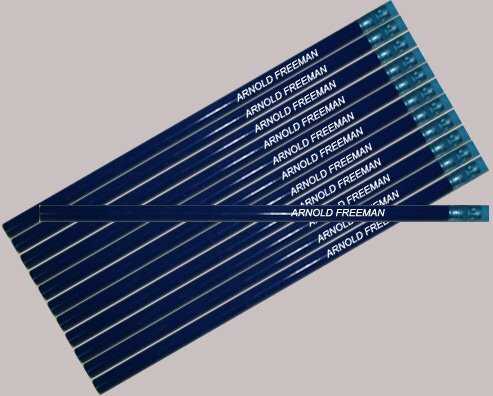 The real fun is personalizing these quality #2 pencils for fundraisers, parties, or gifts. 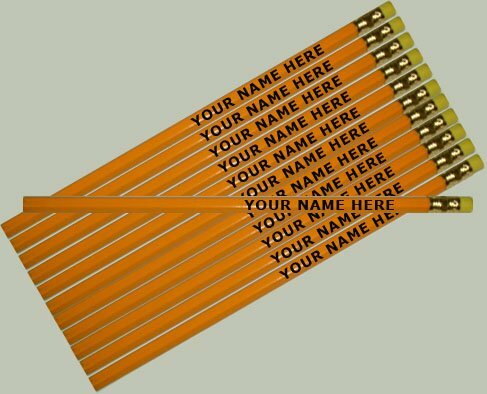 These personalized pencils come in assorted colors; we'll choose for you. Specify name or message; limit 1 line, 30 letters/spaces. 1 name per set of 12. 12 High quality HB No. 2 Lead, Yellow barrel, Hexagon graphite pencils, Non smear eraser. **PERSONALIZATION: Personalized and custom imprinted. You can have up to 32 characters (including spaces) one line (available special characters: $ # - _ @ ? / & ( ) .period ,comma ' " : ; **DO NOT USE ! EXCLAMATION MARK**). Final product will show all letters on upper case. Same text and text color for each 12 pencils. **SHIPPING: Pencils orders are normally shipped by "USPS" United State Postal Services; please make sure your address is a valid USPS deliverable address.